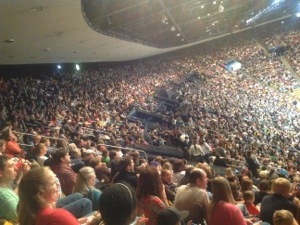 This is a picture of more than 4,000 5th graders from Pleasant Grove, Provo, Orem, American Fork and other towns in Utah County. The event is called Hope of America. It’s held every year in April. We’ve been coming to see our kids perform for five years. I have an 11 year old in that crowd somewhere. We have one more year, as my two youngest look forward to participating next year. Obviously it is a HUGE undertaking. Admission is free. Four thousand kids means eight thousand parents. 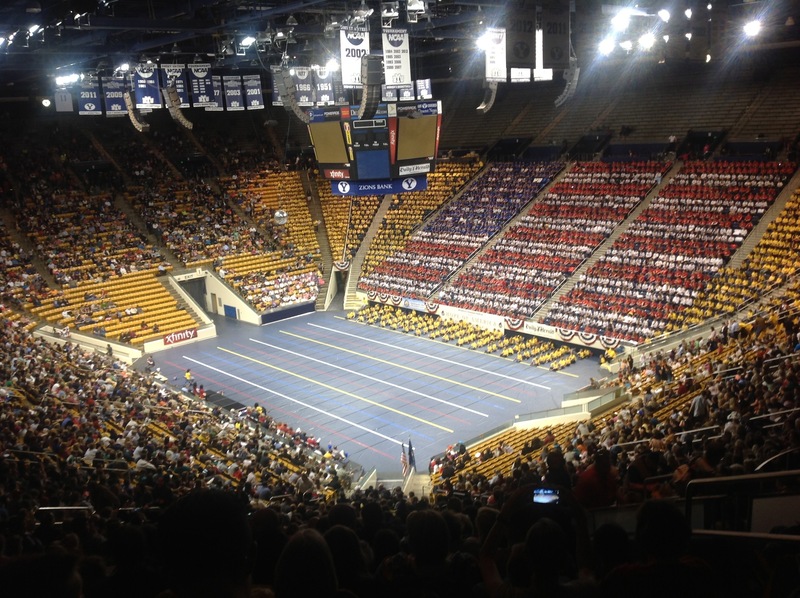 Throw in Utah’s traditional large families , and you pretty much fill the BYU Marriott Center. Because there are people willing to dare big things. In this case it is Kathy MacDonald. Eighteen years ago she envisioned a program to honor our nation’s veterans and involve gradeschool kids. Now, 18 years later, it’s grown to two nights. (The same number of kids will be there tomorrow night.) And it’s part of the Provo Freedom Festival. Kathy had to make a pretty big leap of faith. I’m a firm believer that the way to accomplish big things is to be good at accomplishing small things. Eat the elephant one bite at a time. But, there is a point at which the incremental approach starts to break down. The Wright brothers first flight might have been short, but it represented a quantum leap. Alexander Graham Bell’s telephone wasn’t just a slightly better telegraph. When John Glenn climbed into the Gemini capsule, he was not taking his place as the first American in orbit by flying a slightly faster plane. I worked for Microsoft in 1995 when the infamous “Internet Memo” went out. It’s easy to think of the Internet as having always existed. Sure, we all know that it was invented back in the 1960’s and was mostly for research. (Okay, maybe it’s geeky IT folks who know that.) However, in 1995, the Internet as we know it today really started taking shape. Microsoft bet big on the Internet. Interestingly, they were considered too late. Netscape had the browser market locked up. Microsoft had Office products and they had the desktop, but they really were too late to get into the Internet. And then Microsoft bet big. They put everything they had into pivoting the company to becoming an Internet company. There was no guarantee that it was going to work. If it didn’t the computer world would look much different today. For small businesses, those type of big bets typically involve deciding to hire their first full-time employee. Prior to that, a sole proprietor can make incremental changes. But, bringing on a full time employee can be a frightening experience. I remember talking to Alan Ashton, the co-founder and president of WordPerfect corporation about making the jump from a partnership to hiring full time employees. What makes those moments so challenging and stressful is the knowledge that things could go wrong. I had a chance at one point in my career to leave the IT industry and go into partnership in the whitewater rafting business. It was a huge gamble. I took the bet. The venture failed. I learned a ton from the experience. So, failure is an ever present specter, waiting like a wolf circling a herd, for any sign of weakness. But, being able to make that jump is essential to growth. And sometimes you’ll discover something magical. 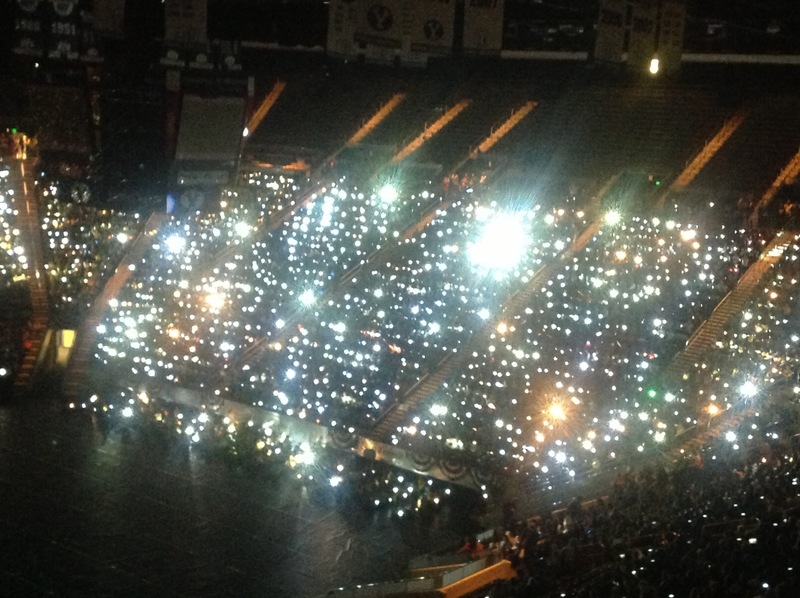 The final number for the Hope of America is called “We Can Be a Light.” They turn down the lights in the arena and all the kids pull out flashlights.